Frank Lloyd Wright's preliminary designs for the Griggs House on Chambers Creek in Lakewood were drawn up in 1946. Construction started in August, 1946 but was halted in October and delayed for several years while final drawings were reviewed several times. Construction was finally completed more than seven years later in November, 1954 using the revised final plans prepared by noted Northwest architect Alan Liddle. The Griggs family celebrated their first Christmas in the house in 1954. The house as originally constructed was approximately 3700 square feet. Contains a cantilevered roof over the gallery terrace, exposed rough-cut wood trusses, large floor-to-ceiling windows, mitered glass corners and employs a four-foot grid system, larger than most Wright plans, which governs the location of piers, walls and partitions. 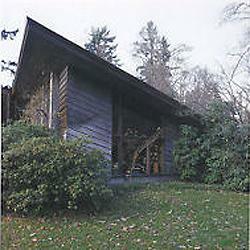 This property was designated a historic landmark by the City of Lakewood in 2003. 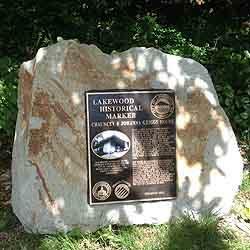 This marker is provided by the Lakewood Historical Society, the City of Lakewood, and the Pierce County Landmarks and Historic Preservation Commission.